This apple (the variety is called “Big O”) was last seen in 2006 at the USDA/NRCS Jimmy Carter Plant Materials Center in Americus, Georgia. They distributed these trees to people who inquired and have since stopped distributing. The breeding program is over and the trees no longer exist in Americus (so I’ve been told). DESCRIPTION: ‘Big O’ is a small tree that grows 20-30 feet tall from a slender trunk. The blossom petals are pink/white fading to whitish and the normal blooming period in Americus is mid-late March. 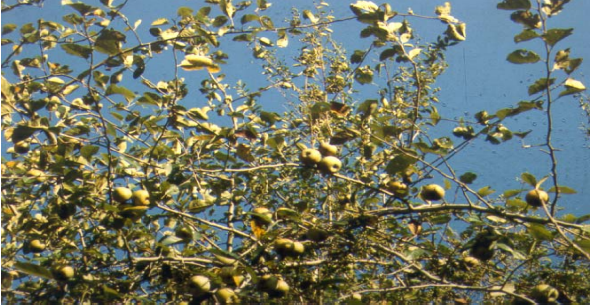 The mature fruit is 1 ½ inches in diameter, greenish yellow and ripens in November. Why am I looking for this tree? It’s extremely disease resistant, blooms rather late for a deep southeastern apple, and the crop matures late. It grows true-ish from seed, and the fruit itself is a larger sized crabapple. Get in contact with me if you find this apple or knows someone who might have this apple! Just leave a message on here or find me on Facebook. I would love budwood this summer or scionwood this winter if possible!